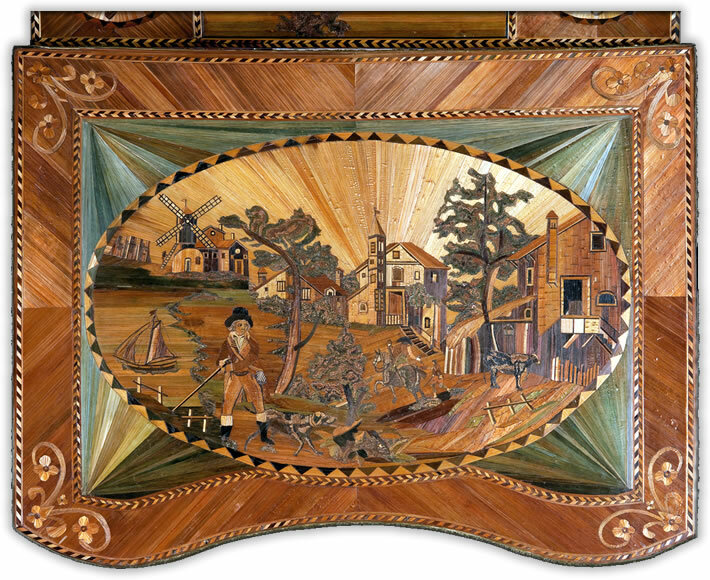 Referred to as a powder table due to the believed modification of it’s original size, The Straw Shop is pleased to share this very rare table known as ” Powder La Fayette”, circa 1790. The table is thought to be 1 of a suite owned by the La Fayette family. 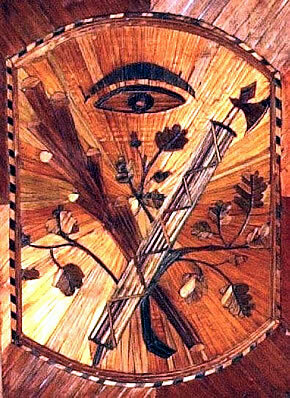 Not only is this table a splendid example of straw marquetry, but it is of historical significance as well. Marie-Joseph Paul Yves Roch Gilbert du Motier, Marquis de La Fayette (6 September 1757 – 20 May 1834), often known as simply Lafayette, was a French aristocrat and military officer born in Chavaniac, in the province of Auvergne in south central France. Lafayette was a general in the American Revolutionary War (1775-1783) and a leader of the Garde nationale during the French Revolution. 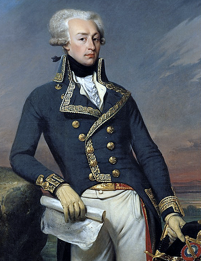 In the American Revolution, Lafayette served as a major-general in the Continental Army under George Washington. In 1824, President James Monroe invited Lafayette to the United States as the “nation’s guest”; during the trip, he visited all twenty-four states. For his contributions to the American Revolution, many cities and monuments throughout the United States bear his name. The subject matter depicted on the table is one of mystery and conjecture. Some of the pictures are thought to depict childhood scenes from Lafayette’s life in Chavaniac. Other scenes are attributed to his departure to America, the Iroquois chief sporting a moustache and beard is thought to be Lafleur, a soldier that became the chief of one of the six Iroquois nations, and Kayewla, another Indian Chief and friend, his military and family memories and symbols of Freemasonry. 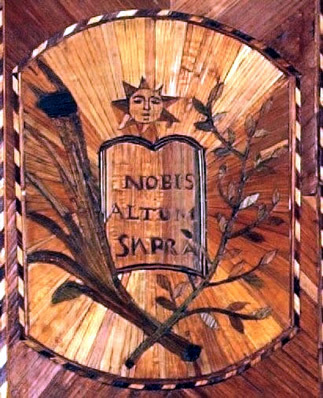 A structural description is as follows: The table, which has been expertly restored by Straw Marquetry Master Lison De Caunes, is 31.8 inches high, 19.8 inches deep and 26 inches in length. 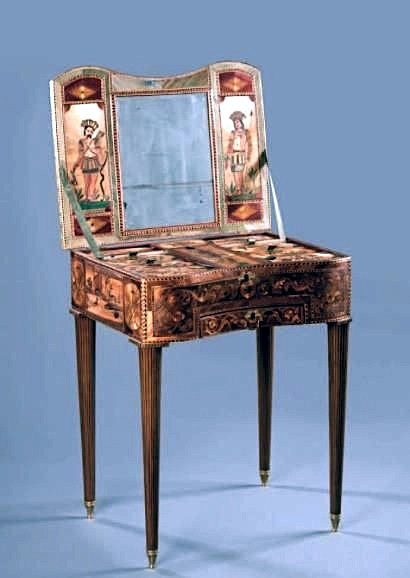 It has a curved front table top, which opens to reveal a mirror and10 compartments above a decorative drawer. The table was sold most recently at auction, in May 2011, for €150,000. 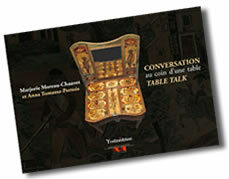 For additional information about the table we offer a collectable booklet, written in French and English, entitled Conversation at the Corner of a Table. (ISBN 978-2-84668-187-2) The Straw Shop offers a limited number of this 40 page color booklet, which further describes the history, research and symbolism associated with the table and is available for $10.00.